Daniel LaCroix, Senior Engineer on the Technical Support Team. I’m sure there are ways to add drama and intrigue to my upbringing, but I don’t know them. I was the third of four children, born and raised in the suburbs of Dallas/Fort Worth. My father was an athlete and my mother a musician, so I devoted time to both. I played the piano and as many sports as I could. After high school, I went to Trinity University in San Antonio to study engineering and play football. I played football for all four years (started for 3) and found engineering to be rewarding due to the amount of knowledge I was attaining. Despite all of the good stuff I was learning, I remember taking fluid mechanics and thinking, “That’s an awful large amount of assumptions we’re making to solve what looks to be a relatively simple problem.” This led me to apply to grad school. I chose Texas A&M because of their strong Mechanical Engineering program, but also because I would be a 4th generation Aggie (whoop!). My Ph.D. advisor was a man named Kumbakonam Rajagopal, a giant within the field of mechanics. Under his tutelage I learned to analyze and ask questions that had never occurred to me before. After completing my dissertation, I taught undergraduate courses for a few semesters before leaving academia. I knew I wanted a position where I could use my technical knowledge, but could also interact with people. I found that opportunity at Pointwise and have been here ever since. The standards: Pointwise, Outlook, perhaps some Microsoft Office tools. I use XWin Server to access other computers and execute processes from the command line. Also, it’s amazing how useful WordPad and Notepad can be. Lists! Lists are everywhere, often scattered about in an organized mess. Perhaps you saw Michael Mirsky’s “This Is How I Mesh,” and he discussed the quiet calm of the Developer’s office. Working in Technical Support, we are decidedly NOT quiet- we are constantly on the phone, asking opinions, and involved in open discussion. 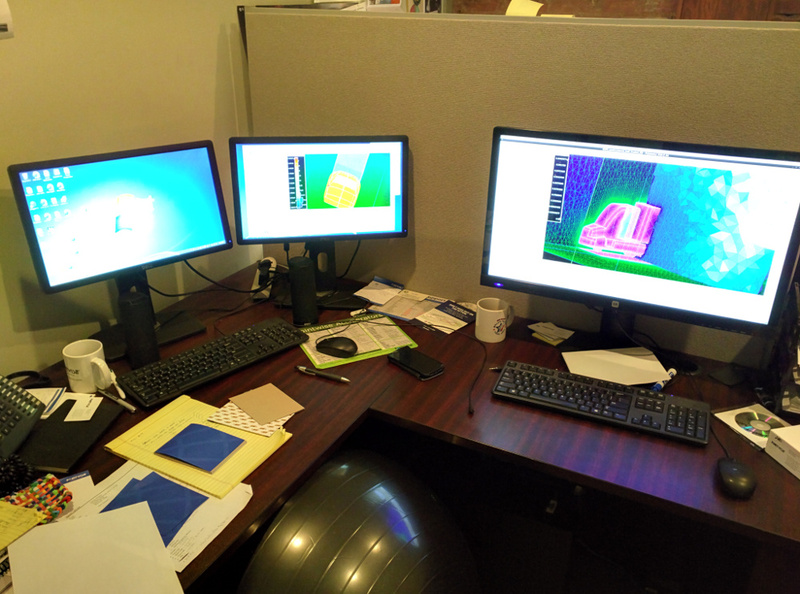 Right now I’m focusing on quality assurance (QA) for a few new features being implemented in Pointwise. I run them through a variety of tests and report back to the developers to let them know what looks good, but what could also use some improvement. I don’t know if I have one specialty, but recently I’ve been gravitating towards structured meshes. They present an interesting challenge in how to organize a geometry to accept structured domains and blocks. Though I realize it’s not meshing per se, I also have experience creating plugins for Pointwise. For this reason, questions about creating a plugin tend to get funneled to me- which I like! Whenever we release a new “dot” release (17.2, 17.3, etc.) we introduce new features and these features are highlighted in webinars shortly after release. For an update on what’s changed, and how it can be used, check out the webinar! One summer, an intern for one of our customers was writing a script to mesh a geometry with some pretty tough nuances. Through a series of back and forth emails, I was able to help him through the necessary steps to make a good mesh. It was rewarding to help a relatively new user tackle some of the tough issues he was facing. Going back to my graduate work, I have the most experience with OpenFOAM and ParaView. As a result, they are still my preferred solver and post-processor. Next-Generation CFD for Hypersonic and Aerothermal Flows, by G.V. Candler and CFD Vision 2030 Study: A Path to Revolutionary Compuational Aerosciences, Slotnick et. al. both of which deal with the current issues facing CFD, one in a generic manner and the other with regards to a specific case. Going to shows is something I really enjoy because I enjoy technical conversations. I have already attended ASME TurboExpo in Montreal, AIAA SciTech in Orlando, and AIAA Aviation in Dallas. I don’t think I’ll be going to any other shows or conferences this year, but I’m always up for it! Lately I’ve started to experiment with sous vide cooking. I also enjoy playing Destiny on my PS4, working out, and playing the guitar. The last great meal I had at a restaurant was at a place called Clay Pigeon in Fort Worth. The roasted bone marrow was killer. Generally, I like local places and try to avoid chains as much as possible. 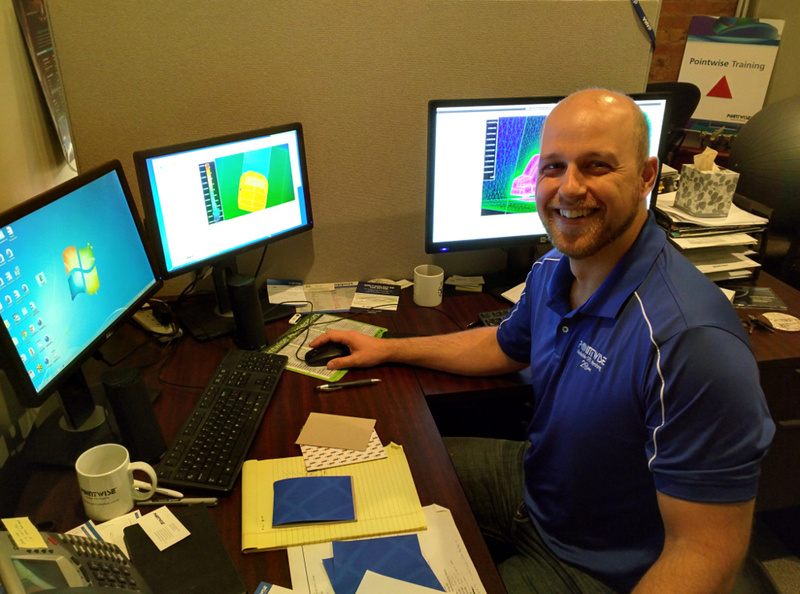 This entry was posted in People & Places and tagged AIAA Aerospace Sciences Meeting, AIAA Aviation, OpenFOAM, ParaView, Pointwise, support, This Is How I Mesh, TurboExpo, webinar, webinars. Bookmark the permalink.